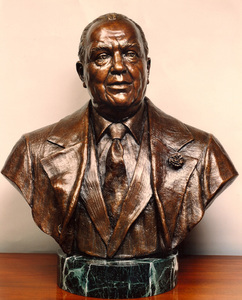 This life size bronze bust is a portrait of Chicago's Mayor Richard J. Daley, the father of Mayor Richard M. Daley. Two castings were made. One casting was in the Mayor's Office and the other casting is the Hilton Hotel.